Recently we went to a friend’s house for a barbecue (I am a huge fan of summertime barbecues). 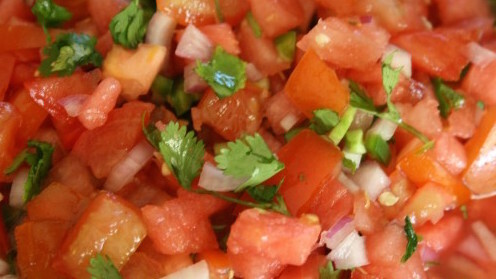 Wonderful food was served including watermelon salsa. 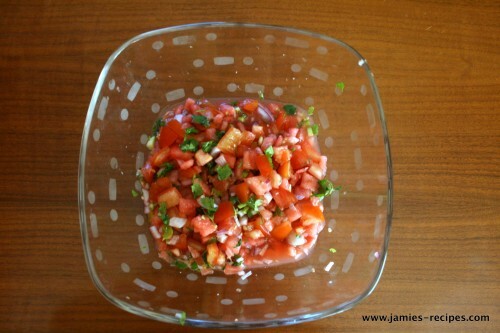 I had never had watermelon salsa before and after the first taste, I knew I had to replicate it at home. To some the idea of sweet fruit combined with spicy jalapenos may not sound like a winning combination. 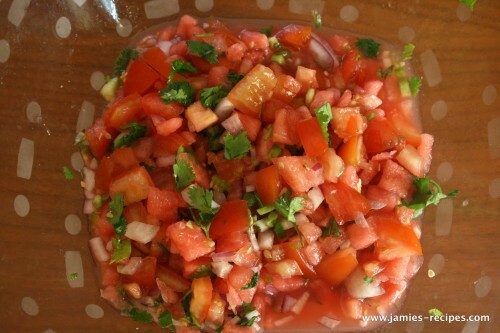 The watermelon provides a sweet coolness to an otherwise regular tomato salsa. Please make this for your Fourth of July get together or next family barbecue. This is a refreshing snack to enjoy while you are waiting for the coals to heat up, while you are sitting around chit-chatting with friends and family, and/or while you are enjoying a frosty beverage. Combine all ingredients in serving dish. Stir together. Season accordingly. Feel free to add more of any ingredient according to your taste preferences. Serve with tortilla chips. Enjoy! Looks de-lish Jamie!! Happy Birthday, I hope someone made you a big tasty cake!! We had this at Jamies’ Father’s Day Barbeque and it was delicious.